Robert Frost wrote a poem that became famous ‘The Road Not Taken’. That is exactly what Filles De Kilimanjaro is: a road not taken. You can look down the musical path see its possibilities, may be it looks dangerous, difficult. Herbie Hancock described working on the album. “We were always trying to create something new. It became more and more difficult. Like trying to make conversation never using any words you used before.’ Nothing in this album is predictable. The album could be recognised in the future in the way that Kind of Blue is thought about now. The title, ‘Filles de Kilimanjaro’, refers to the Kilimanjaro African Coffee, a Tanzanian coffee importing business in which Davis had invested. The mysterious 'Filles De Kilimanjaro' is one of the enigmas of the musical life of Miles. It is unique; there is nothing else remotely like it. The musicians had worked together constantly for four years. They played the same standards every night. : ‘Stella By Starlight ‘, ‘Walkin’’, ‘Milestones’ ‘’Round About Midnight’, ‘All Blues’. The rapport they had established is given a new challenge here with fresh themes, different themes that made them think and play differently. The album stands at the point where the great quintet of the sixties starts to change and morph into the fusion-rock-electric period that endured for almost the next decade. At that point in 1968 Miles was at the jazz pinnacle where his quintet was recognised as being unparalleled: Wayne Shorter, Ron Carter, Tony Williams, and Herbie Hancock had produced an exciting series of albums: Nefertiti, ESP, Miles Smiles andSorcerer. All with music that was excitingly intelligent, provocative and challenging. Yet Miles was restless dissatisfied. He wanted a different kind of music, more space, silence, music that explored the idea that ‘less is more’, understatement. It was challenging the jazz routine of head-solo-head-out that is still too prevalent. These compositions re-evaluate the relationship of theme to solos: there are multiple themes that postpone the improvisation until three or four minutes into some of the pieces. Dan Morgenstern, the writer, claimed that it was widely known that the recording date ‘was largely written and arranged by Gil.’ It was also believed that Evans was involved in arranging bass lines, voicing horns, and was the uncredited co-composer for ‘Petits Machins’. It is likely that the intricate lines by saxophone, electric piano, and bass heard against the melody of ‘Tout de Suite’ are by Evans. Later Evans, with his own group, recorded ‘Petit Machins’ under his own name retitled as ‘Eleven’. 'Filles De Kilimanjaro' was recorded in two stages. ‘Petit Machins’, ‘Tout de Suite’ and 'Filles De Kilimanjaro' were recorded on 19 to 21 June. ‘Mademoiselle Mabry’ and ‘Frelon Brun’ were set down on 2th of September. In between the sessions, Ron Carter and Herbie Hancock left; Dave Holland and Chick Corea joined. 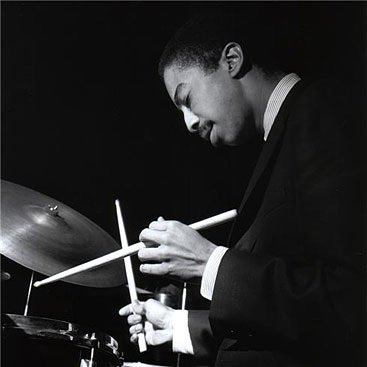 After Miles, Tony Williams was the most important player in the quintet. Williams joined Miles Davis when he 17 and he immediately had a vital impact on the music. Williams was: "the centre that the group's sound revolved around," was how Davis expressed it. Listening to any of the quintet’s records, you can hear how the young drummer controls the tempo and the shifts in rhythm. Probably his work on 'Filles De Kilimanjaro' was the apotheosis of his methods. All the music on the album has a quality of abstraction, even the drumming is abstract. Williams provides a rhythm but not a conventional beat. He was used to fragmenting the beat but across the album he severs the relationship with past rhythms and ensures that, because he is not following a conventional pattern, his work has more interest. It is worth listening to the whole album just to take pleasure in the drumming. Tony Williams sets the rhythm for ‘Frelon Brun’. He was once described as playing alongside the other horns rather than accompanying them, probably a good description of his work across this album. Davis is lucid over a riff set by bass and Corea’s keyboard. The first Davis solo is set against the restless drums. The bass and keyboard sustain a steady rhythm throughout. Shorter is a more melodic version of Coltrane. Dave Holland was making his first recording with Miles. The quintet recorded two takes of the theme ‘Tout de Suite’. The main theme is a 70-bar melody. The melody and harmonic structure during the head is relatively consistent between both takes. Herbie Hancock opens the track playing with just soft whispering cymbals. Eventually the intricate lines are beautifully voiced. Under the solos Hancock goes for pontillistic promptings. However, the improvisations differ markedly between the two takes. The extended 70-bar head of ‘Tout de Suite’ consists of five sections. Sometimes Williams goes for relentless insistent tapping. There is a bluesy finish to Hancock’s solo before the return to the theme. The alternative title ‘Eleven’ refers to the 11/4 meter heard during the first portion of the theme. It is a strong theme all underpinned by the ever creative drumming rhythms that are clear, free and disciplined. Bass lines come and go creating a lattice of pulses to inspire Wayne Shorter who is more melodic here. The quintet plays the 11/4 meter with a repeating riff. In the second section there is a 10-bar section in 4/4. metric identities with each restatement. The bright optimistic of opening to ‘Filles de Kilimanjaro’ is a contrast to some of the other themes. The group plays the melody to ‘Filles de Kilimanjaro’ three times prior to the improvisations and combines sections A, B, and C during Hancock’s solo, and ends with a second solo by Davis. The recording concludes with a fade rather than with a return to the theme. ​Davis had recently met guitarist Jimi Hendrix through Betty Mabry Miles’ new girlfriend, they married that month. It is Betty Mabry’s face that appears on the front of the album. ‘Mademoiselle Mabry’ is Gil Evans’and Miles’ direct reference to Hendrix; the opening chords relate clearly to Hendrix’s song, ‘And the Wind Cries Mary’. Critic Ralph Gleason said that every time he heard the album it became a new sound track to a new movie in his mind. This one is the most languid, sensual track. Filles De Kilimanjaro really was the road not taken. It is interesting to speculate how music would have been different if Davis had continued to play the more cerebral jazz explored here. Would it have alienated the audiences that he craved? Whatever, the music moved on, Davis moved on, and we are left with music that is as fresh and relevant now as anything produced since: a glittering iceberg in a steamy, tropical forest.